One of the joys of working in public media is the ability to be responsive to community needs. We have a responsibility to form meaningful partnerships that leverage our greater potential and to develop new resources together that can have a long-lasting impact. The definition of success, for us, is complex, and not always measurable; it usually includes an anecdote or two at least. The most important determining factors are social capital and quality of content; then come the metrics of analytics, demographics, and revenue. In this way, the community finds success in our success. Before you can begin to define success though, you must first define the community need. A local Economic Development Council (EDC) was seeking assistance with a workforce development initiative aimed at encouraging middle-school students to consider pursuing a career in the manufacturing industry after graduation. The EDC was working on behalf of local corporations struggling to find skilled workers to fill vacancies even while many required only a technical certification and not a college degree. This while the unemployment rate was over 10%, students were misinformed about careers in manufacturing, and many were fleeing our region at an alarming rate after becoming educated; partly because they were unaware about potential career opportunities. Our team connected with manufacturers and educators to develop a 4-minute video that would be distributed through our network including 32 school districts. The video was hosted by a local high school student who introduced manufacturing as an exciting and technological career pathway featuring interviews with employees; in non-traditional fields when possible. The video also cleared common misconceptions regarding job outlook, income potential, and working conditions. The video was well received by the EDC, manufacturers, school districts, and students. This could have been the end of the story. If it was, it would still be a story of success. However, we were challenged to think beyond this as one of our educational partners informed us that manufacturing was only one of 16 career clusters identified nationally as experiencing a shortage of skilled workers entering the workforce while simultaneously cash-strapped school districts were now required to complete career plans for all students. A meeting of the minds took place with our team, representatives from the EDC, the Chamber of Commerce, Workforce Development Board, and the Board of Corporative Educational Services (BOCES). BOCES is a network of local school districts providing cost-effective shared services, including career training for high-school students and adults, special education, alternative schools, technology education, and teacher training, as well as dozens of programs to expand educational opportunity and help districts operate more efficiently. We set out to develop a career pathing resource for students, educators, employment and training agencies, and underemployed adults to explore career options and prepare for college and/ or a career. To meet over three-thousand 9th grade students where they were, we created an interactive and mobile responsive website featuring one video per career cluster and resource page for each of the identified career clusters. The website would serve as a GPS for Success SM so that students might navigate their career path to a bright future. Over the next three years, we met with hundreds of industry leaders in their respective career clusters to develop www.MyGPSforSuccess.com. They advised us on the scope of each video, webpage content, and helped to identify candidates for funding for each career cluster. Additional website resources include links to scholarship information, a career interest survey, curriculum resources, and student resources. Additional phases for the initiative will include resume building skills, interview skills, and lessons on ethics in the workplace. GPS for Success SM identifies real career opportunities in our region, income potential and education requirements in each cluster. It is the only resource with established connections among State educational agencies, secondary and post-secondary educational institutions, employers, industry groups, and other stakeholders. Our station has developed a licensing agreement so that the website and resources can be tailored for other markets. 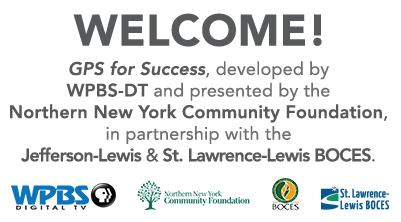 The presenting sponsor of GPS for Success SM is the Northern New York Community Foundation. Jefferson-Lewis & St. Lawrence- Lewis BOCES have also been instrumental in the success of this initiative. GPS For Success SM was recently awarded a Certificate of Excellence by the New York State Economic Development Council in multi-media marketing and the North Country STEM Network Community Partner Award.